With the arrival of spring, it’s not only crocuses that are poking their heads up and out. As residents arise from hibernation and walk and bike to take in the splendors of the new season, they come upon some downtown dreary. The unsightly litter once hidden under snow and winter detritus is hard to miss. The community wonders why the jersey barriers that were put up as a temporary safety measure along Theodore Fremd Avenue 12 years ago, after Blind Brook overflowed and the retaining wall was seriously damaged, are still there. And whether Theodore Fremd will ever be repaved and not just given an occasional patch. 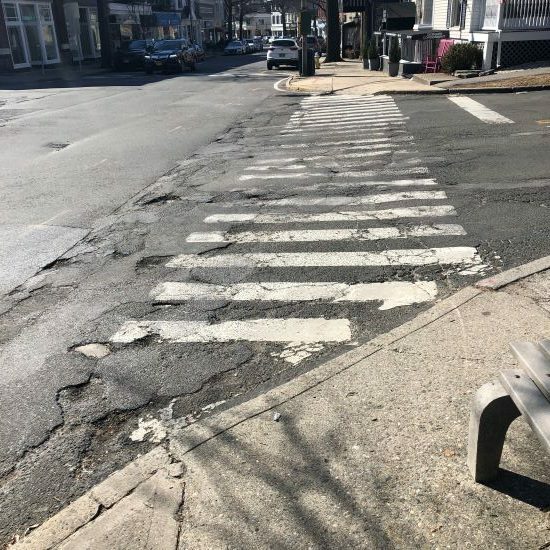 Will the crumbling crosswalk at the intersection of Purdy Avenue/Purchase Street/Theodore Fremd ever be transformed into a safe crossing with clear signage for both pedestrians and drivers? On regular walks to the Post Office, I often check the newspaper boxes to see if they contain more trash than reading material. With only one trash receptacle on the north side of Purdy, shoppers, restaurant-goers, commuters, and visitors are in apparent agreement that the empty newspaper boxes are a good option for depositing their trash, as are the planters outside the Post Office. Is there a reason that Rye is the only community in the area without a regular downtown village police officer? Someone to ensure that old-fashioned and welcome monitoring of the Central Business District is provided? Especially on Friday afternoons when the town is overflowing with rambunctious kids? As more and more drivers disregard the one-way egresses at three of the municipal parking lots — to make their dinner reservation, drop the kids off to pick up pizza and ice cream, make a deposit at a bank, find a parking space before another driver who actually obeyed the traffic law — are we likely to see an uptick in accidents, if not an increase in tickets? In recent months, two residents headed to the Y were hit by cars — one driver stopped, the other didn’t bother. Another resident was hit in the Purdy Avenue crosswalk — where she had the right of way. In the last three weeks, I have witnessed the following vehicular madness: U-turns on Purchase Street and Elm Place; drivers not coming to a stop at stop signs on Purchase and making fast right turns on to Locust Avenue; cars backing up in order to get an unmetered parking spot on Elm. Mayor Josh Cohn provided some good news on several fronts. The Blind Brook wall reconstruction by Fremd and Purchase is in redesign because Con Ed determined that it could not move the gas line without substantial street renovation into streets to the north. There will be a new trash can on Purdy Avenue and some other locations as well. The Mayor has circled the Locust Avenue issues with Interim Police Commissioner Rob Falk.